SVI, through NanoEnteK offers a complete solution for image analysis for cell counting. All -in-one live cell imaging system for use inside a cell culture incubator. 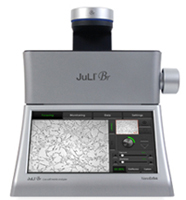 JuLI™ Br consists of a brightfield scope unit with long-life LED illumination technology and integrated high-resolution digital color camera, as well as a station unit with inbuilt computer, powerful imaging software and brilliant 10-inch touch screen. The station unit can operate up to two scope units which allows for the comparison of two samples or control and experimental sample. 3-channel (bright field, green fluorescence and red fluorescence) desktop image analyzer that allows users to perform assays for cells in suspension, including GFP and RFP expression, apoptosis, cell viability (live, dead, and total cells), cell cycle, and cell counting assays using state-of-the-art optics. It is compatible with a wide variety of eukaryotic cells. Depending on complexity of the assay and number of fields captured, it takes 10 seconds to 2 minutes that Arthur™ counts for a typical assay with only 25 μL of sample volume. Increasing number of researchers are using live-cell imaging to study cellular functions. 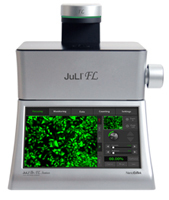 JuLITM Br, smart bright-cell movie analyzer, was developed to enable variety of biological experiments for live cell imaging. Capturing time-lapse images & making a movie. With the states-of-the art optics, JuLITM FL enables users to perform the image capturing and the time-lapse movie making. It also can support cell counting and measuring the level of fluorescence expression.